WORD KEEPER . . . – Mom Grams . . . I have tried repeatedly to get this picture on my title page as a logo and failed….so I am sharing it this way for now. This is a picture painted by my daughter, Karen. When she gave it to me, she stopped just before handing it to me and labeled it “Word Keeper” and signed it for me with her logo–an O with a K superimposed. When she handed it to me, I almost exploded! Look at her painting as closely as you can. 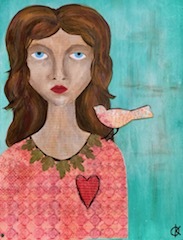 The bird sitting on her shoulder is filled with words and whispering his words into her ear. The lady’s heart has words printed in it. The necklace around her neck is made of real leaves. This painting is a “word” from my God to me through her . . . confirming what I have known all my life, but not pursued with discipline. This painting blessed my socks off! It was also a concrete expression of the ongoing restoration of our relationship. This daughter has been through hell and come back. She has had friends and family praying for her, offering support and counsel when she was able to hear and receive it. However, in that process, she became disenchanted with “church,” and the Christian expression of religion. What concerns me is that God appears to be in no hurry to stop her movement in directions other than towards Him–looking to other religious expressions not connected to the price paid for her and us all by Jesus. Obviously, my real issue is with the Lord. He is not moving on her heart with my timetable! Only HE can heal her heart of pain and the perception of judgement and rejection by some Christians. I know this not my job. Only the Holy Spirit has the ability to reach into the recesses of our hearts and touch, heal and deliver us from whatever is holding us back. So this becomes an issue, not between my daughter and me, but an issue between me and God. Do I really trust and believe he hears prayers for truth to be revealed? Do I believe at my core what my mouth and the Bible say about God? Will he really honor his Word? When I pray according to his will and word, do I really believe it will come to pass–even when I do not see it? Can I trust God even when things don’t happen as I hope they will? These questions can be translated into our concerns not only for ones we love, but for our communities and nation. If the elections today do not go well, if the next 4-8 years lead to financial disasters and community disintegration, will I still trust God to see me and my loved ones through it all? All these questions remind me of my heroine, Corrie Ten Boom. Read her story, The Hiding Place; it will explain my adoration for her. Corrie suffered beyond what any words can explain; she too had struggles of faith in suffering. But, in all her questions and pain, Corrie determined what Truth is and submitted to the Lord on HIS terms without understanding everything. And, to me that is the Key to faith. When the revelation of who Jesus is hits you (the realization of the Truth of God in Christ), it is done, finished, complete. The rest of the journey is to remember who HE is and walk in that trust . . . live or die. Trust me, life can present issues that will attempt to push you into denying or abandoning the Truth. We all get tired, angry, lose hope now and then, hurt, wonder and question. But, it all comes back to that foundation: Truth is truth, He is who he says he is. Our part is to hold on to Him tightly when the winds of life hit you with hurricane force. We are all leaky vessels that need continual refilling.